You can find Brimstail's Dungeon in the Tree Gnome Stronghold. 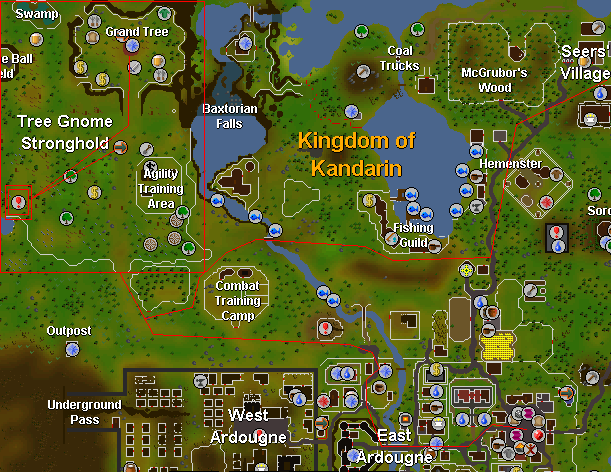 The Stronghold is located west of Seer's Village and northwest of West Ardougne and East Ardougne. 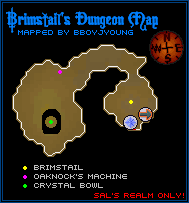 When you enter Brimstail's Cave, you'll notice the "Premade choc s'dy", or Choc Saturday respawn on Brimstail's shelf. Don't take his bowl or he'll get mad! 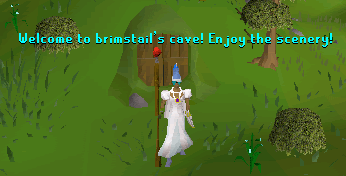 Brimstail is known for being the only gnome in the Runescape with the ability to teleport you to the Runecrafting Essence Mines. 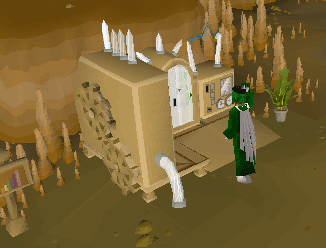 You must have completed the quest Rune Mysteries to have him teleport you there by right clicking him and selecting "Teleport". Brimstail now has an even bigger role to play. He's the main character used in the quest, Eyes of Glouphrie, which you can start by talking to him with 5+ Construction and 46+ Magic. As you move into the larger of the two rooms, you'll see Oaknook's Machine. Next to it is the Aspidstra Plant that goes "Gronda Gronda" when searched. Is it a plant? Or is it a sentient creature in disguise? 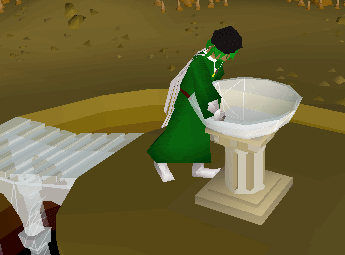 After the completion of the Eyes of Glouphrie Quest, you will see a crystal bridge leading to the crystal bowl. If your Crystal saw becomes uncharged, you can recharge it there by using Sing-glass on the crystal bowl. The saw will revert to a seed after building 28 items with it. Finally, in the southwest part of the room, you'll find a broken statue of Glouphrie the Untrusted. 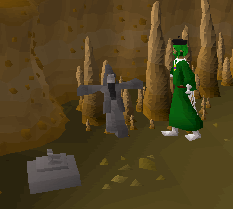 He's the only NPC down here in the dungeon, and will teleport you to the Rune Essence Mine if you ask him to. He also plays a role in the Eyes of Glouphrie Quest.